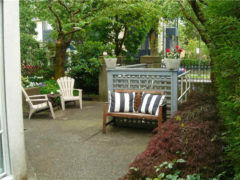 House-like 2 level townhouse with amazing OUTDOOR space great for entertaining and BBQ, with a bedroom on each floor. Corner home has private entry through gorgeous cherry trees. Totally renovated kitchen & bathrooms feature in-floor heat, Italian porcelain tile & natural stone, all new stainless steel appliances, cabinets & counters. Eat-in kitchen with floor to ceiling window, plus for dinner guests. Good size rooms, lots of storage, 2 patios & wood burning fireplace. Steps to shopping, transit & parks. PRICED TO SELL FAST. (BELOW GOVERNMENT ASSESSMENT).